Overcoming the frame split … Round solutions for your requirements! For metric break-outs from M20 to M63, CONTA-CLIP has added round cable entries for cables with or without attached plugs to its portfolio. In case of maintenance or retrofitting with assembled cable harnesses, cables with diameters from 2 to 35 mm can be quickly and safely inserted into the switchgear cabinets or housings. Sealed according to IP66. The modular system ensures quick and easy assembly in three steps. 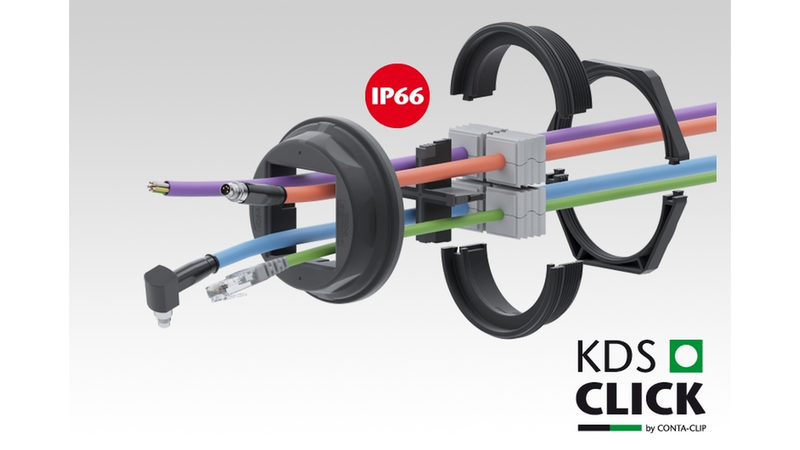 A reliable seal and absolute secure fit is also provided by the slitted, tapered seals with a wave-cut profile, which, after the cables are routed through the cable entry, are placed around the cables and then pressed into the round cable entry. After that, the separable thread and locking adapter is easily screwed together with the round frame outside the switchgear cabinet. The separable locknuts that are mounted on the inside of the locking elements ensure safe and secure attachment.